Hello lovely people reading this, hope you are well. This post is all about ACNE! If you have been a long time follower you will know about my acne journey, if not read on! I have suffered from adult acne since I was 21 years old but it got worse as I got older. I got it on my back and chest and it would make me so uncomfortable to wear certain clothes. I was later told that I have cystic acne across my jaw, you couldn't see it but I could feel it and see it under certain lighting. This made me very insecure as someone in the beauty industry, I had tried a lot of things to clear my acne. nobody bothered to prescribe me to accutane. I kept getting offered facials. Now this is why I decided to do this post. I want to educate all you guys about why I think facials are a waste of money and time if you have acne. I would get a facial every two weeks, the first week my skin was phenomenal but later I noticed it would go back to square one. I decided to see another dermatologist and she was shocked at how long i had suffered without this medication. She got me to do a blood test and immediately after, she prescribed be to 40mg actuate for a total of 8 months. It wasn't easy at all! I had to change my diet, I had to drink more water...I didn't like drinking water but working out helped me drink 3 litres a day. My lips swelled up a lot, my whole body was dry so I had to lotion twice a day, my nose looked smaller after 5 months (yesss!). I kept taking breaks because of how easily I would get burnt and I couldn't even wax or continue my laser hair removal. I decided to stop taking it after six months and instead got into a regular skin care routine. I advise all acne sufferers to avoid facials, they pick and prod your skin making it worse later, there's no way the oil in your skin is even controlled. 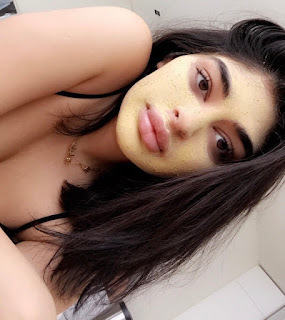 Facials are great if you want a glow complexion for an occasion, or a hydrating one anything other than that I am totally against and wished i didn't bother in the first place. 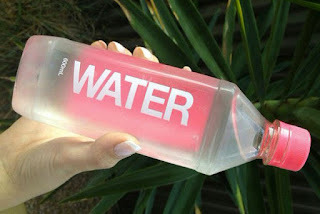 1) Drink plenty of water! 2) Hydrate your skin by using sheet masks every few days! (This is something a lot of women in the Far East do which is why they have amazing skin) remember even oily skin needs hydrating. 4) Exfoliate your skin every week with natural products (it's gentle). 7) Use a clay mask every two weeks to take all the oil out of your skin. 8) Change your pillow case regularly. Please remember this medication is prescription only, consult your doctor before trying any medication and do not try this if you are pregnant or trying. I never let anyone tell me that having bad skin is okay because everyone should have good skin, there's so many remedies for this! I hope this helps some of you beauties out there, Good skin is healthy so please try and clear your skin because it will make such a difference to your confidence. It's been a while beauties! My blog writing days are back, so many of you told me how much you missed us blogging so I thought why not come back with the ultimate review?! 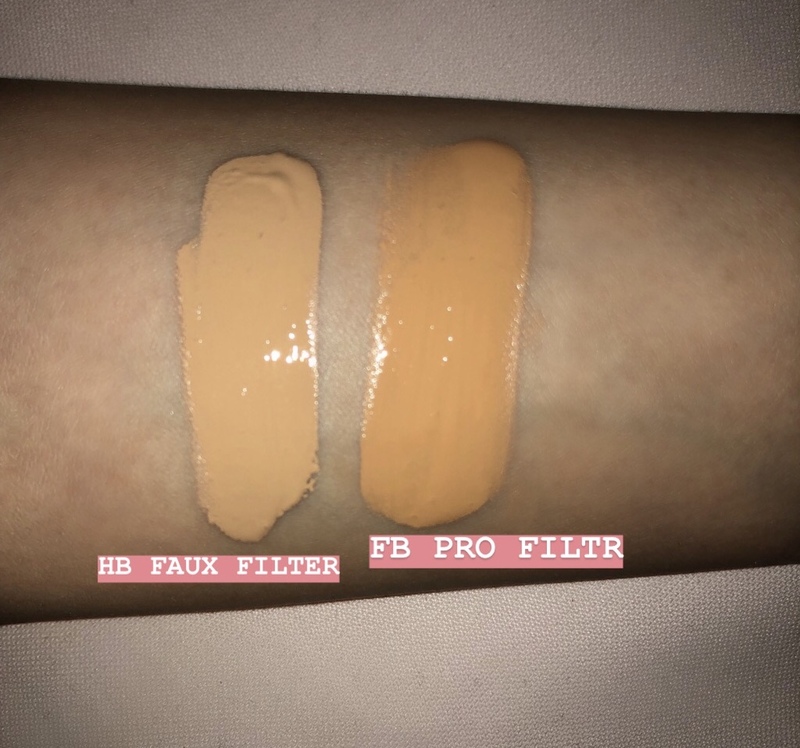 Foundation is one of the biggest makeup struggle for us all! Being a apart of the beauty industry my sister and I are constantly trying brands. Some have broken us out, made our skin dry patchy - that's the life of a beauty blogger! 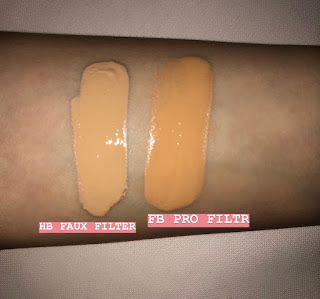 Last year beauty guru Huda released 30 foundation shades! Catering to all skin & undertones. 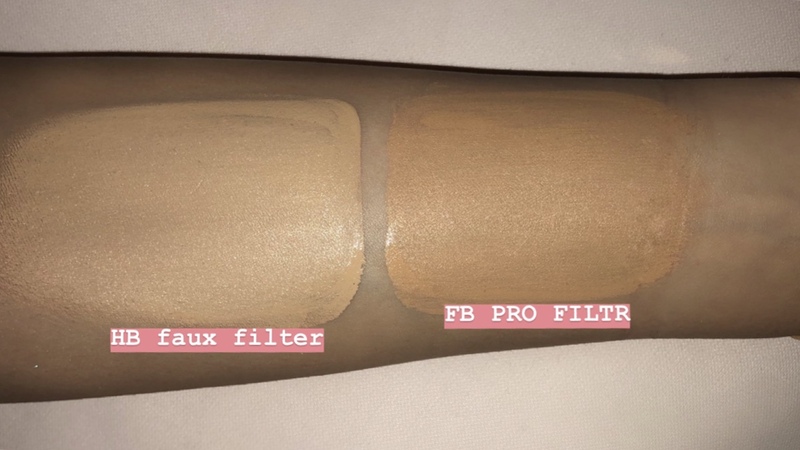 Rihanna also released foundations that have a wide shade range. Both these brands have constantly been compared. 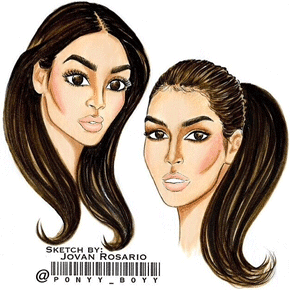 I tried both myself for a few months an decided to give my review as a professional make-up artist and a consumer. 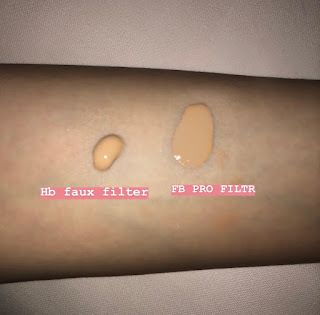 First time blending the pro filtr foundation i was amazed at how smooth it was and how well it matched me, it felt like velvet and I didn't even have to set it! As my skin started to get used to this product I noticed it wasn't working the same when I traveled. 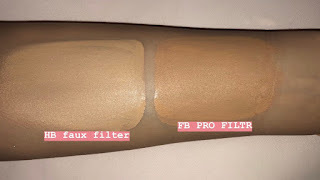 It oxidizes (changes color), sticks to dry patches, becomes flakey and makes fine lines more prominent. It came to realisation that this foundation is catered for oily skin only. when people would tell me they were wearing Fenty I noticed it didn't have that "radiant from within" look, after a few hours it makes me look dry and tired. Blending cream contour always felt like a race because I have to blend it so quick otherwise it doesn't blend. Packaging: pretty and slender, not travel friendly, because it's long it tends to knock over. glass could break on a hard floor. Sonia loves full coverage and encouraged me to try this, knowing I loved a natural finish I was surprised that she advised me to try it. Her skin looked amazing so I was sold on trying it. First pump scared me a little because of how thick it was! 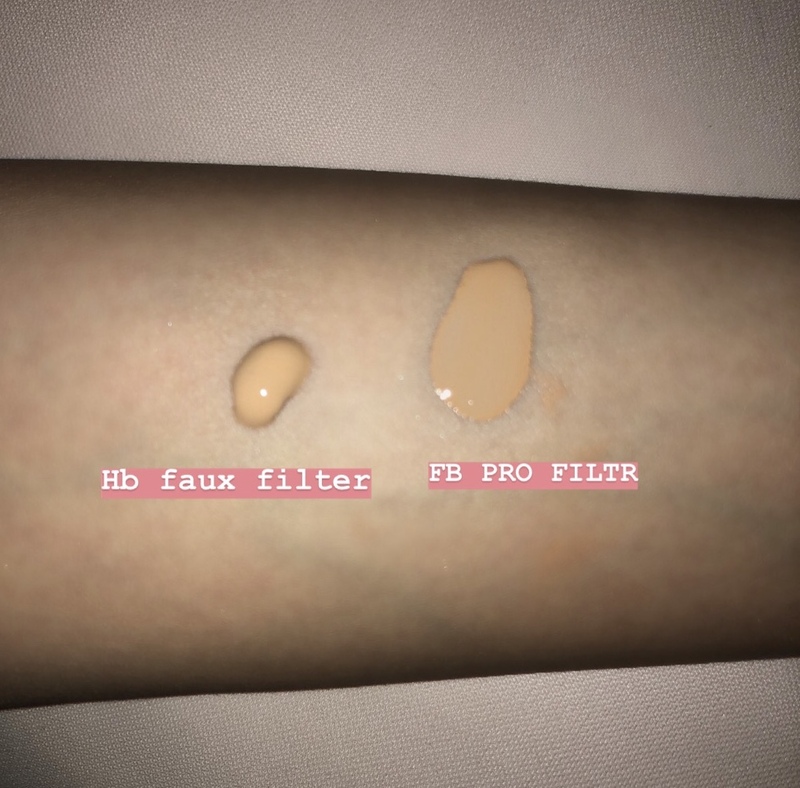 I used a gel based primer and one pump only of the HB foundation, the strong scent hit me but I ignored it and applied it with a flat brush and went to blend it with a damp beauty blender. My skin looked radiant, fresh almost doll like! I loved how it didn't dry so quick, it gave me time to blend in my cream contour and concealer with it. I had control over how much coverage I wanted & how I wanted the finish to be. The loose powder stuck to the foundation nicely and after I sprayed setting spray, I loved the finish look! I had it on for the whole day and at night so many people were complimenting my skin, it stayed looking fresh! The primer broke me out into a cheek rash so I was scared to use it again. Packaging: bulky, travel friendly, not keen on pumps. 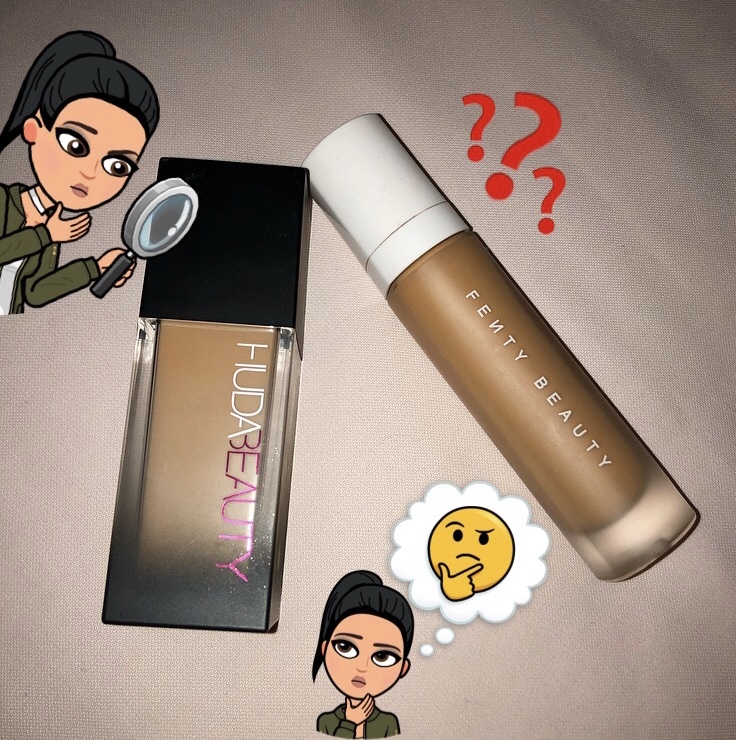 Both foundations are great in their own way but Huda Beauty wins for us both! created by a woman with knowledge and experience in the beauty industry.